Junior wing Dominique Cantave breaks away from the Dartmouth defense on her way to the game winning try. With the Ivy League 7s final in sudden death overtime, Dartmouth wing Ariana Ramsey found herself in space on the right sideline. Ramsey had been showing her speed all day, racking up eleven tries through four games. Harvard’s Arianna Romero, a sophomore wing, was all that stood between the try zone and the speedy Ramsey. Ramsey picked up speed, but was no match for Romero, who made the tackle, sending the Crimson bench, standing just feet away, into a frenzy. On the ensuing possession, Harvard quickly worked the ball to the other sideline, to junior wing Dominique Cantave. 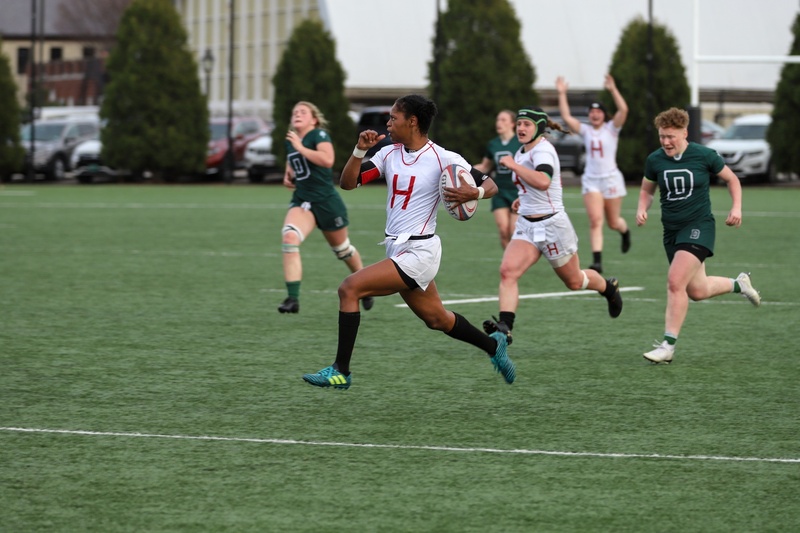 Eluding two defenders, she ran nearly the length of the field to secure the victory —and the Ivy League 7s title — for the Crimson. Harvard (8-2, 3-2 Ivy League) finished the Ancient Eight tournament at 3-1, picking up a win against every team present on the way to their third Ivy League Sevens title in program history, winning the final by a score of 22-17. Their title win was preceded by a 38-0 thumping of Brown, a 29-5 victory over Princeton, and a 31-14 loss versus Dartmouth in the first round. The final against Dartmouth came was a grudge match for the Crimson, as it had lost its last two matches versus the Big Green, as well as last year’s Ivy 7s final. Despite taking a tough loss to Dartmouth just hours before, Harvard was able to get the job done when it mattered, defeating their conference rivals for the first time since last year’s Collegiate Rugby National Championship semifinal. Harvard's win at Ivy 7's was their first since 2015-16. The Crimson got the day started by cruising to a 38-0 win over Brown on Mignone Field. Cantave led the team with two tries, while fellow junior, scrum-half Delia Hellander added two of her own. The win marked Harvard’s highest-scoring shutout of the season, as well as their second-largest margin of victory. The second match of pool play saw the Crimson matched up against Princeton. Freshman fly-half Cassidy Bargell led the team with three tries, while Romero added the other two, one of which was a penalty try. The win, combined with Dartmouth’s win over Brown, ensured Harvard a spot in the final with a game versus the Big Green still to play. The final match of pool play had no bearing on the outcome of the tournament given that both teams were through to the final, but that didn’t mean that either team was going to take it easy. Both teams came out firing on all cylinders, but Dartmouth claimed a slim 14-7 advantage at the half. The Big Green went on to score three unanswered tries in the second half before the Crimson added a try through Bargell, her fifth of the day, as time winded down. The game finished 31-14, and after Dartmouth’s dominant second half performance, they looked likely to claim their second consecutive Ivy Sevens title in the ensuing final. Following the third place match, which Princeton won 26-12 over Brown, Harvard and Dartmouth took the field for a rematch of last year’s final. The Crimson dictated the pace of the game early on as Hellander and Cantave found the try zone for Harvard, but the Big Green responded each time with tries of their own. The teams entered half time tied at 12-12. Bargell continued to impress for the Crimson, tallying her team-best sixth try with just under five minutes to play, putting the Crimson up 17-12. Two minutes later, Dartmouth answered again, tying the game at 17-17 with two minutes remaining. Neither team was able to break through before the end of regulation, meaning the final was to be decided in sudden death overtime. With everything on the line after a long day, Harvard made quick work of the Big Green in overtime. After just a couple of minutes of play near the center of the field, Dartmouth seemed to break away, before Romero’s last-ditch tackle on Ramsey near the sideline. Cantave’s ensuing cross-field run was her fourth try of the day, and undoubtedly her most important score. 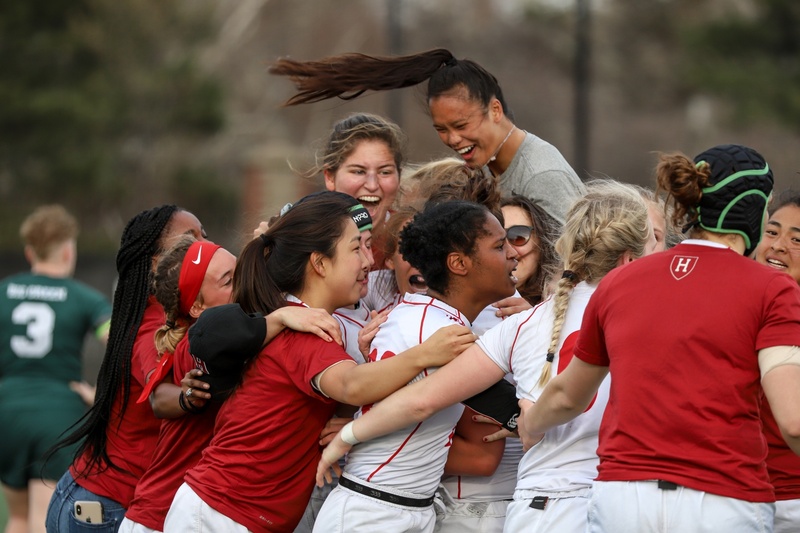 The win marked the Crimson’s third Ivy Sevens title, its first since 2015-16. Harvard will look to add another title, the Collegiate Rugby National Championship, on May 24 and 25th in Tucson, Ariz. Despite their victory over the weekend, Quirion and the rest of the team are already looking ahead to the next challenge. — Staff writer Eamon J. McLoughlin can be reached at eamon.mcloughlin@thecrimson.com.